Exell 26650HP 3.7V 3400mAh LiMN Battery is an ideal replacement battery for many of todays in demand applications such as E-Cigarettes also known as MODS, Vaporizers or Vape products as well as high intensity LED flashlights and Solar Lamps used in gardens and walk ways.This LiMN battery has three-dimensional tunnels that enable rapid diffusion of Li+ through LiMn2O4 particles, and therefore lithium-ion cells made with this material can have better theoretical drain rate capability. Conventional lithium-ion cells use LiCoO2 or variations of that material. Cells with LiCoO2 cathodes are typically designated with the term "ICR". The LiCoO2 type materials have a layered crystal structure that only enables 2D diffusion within the layers, so the overall Li+ diffusion rate is slower. Exell 26650HP 3.7V 3400mAh LiMN Battery Applications: Solar Lighting, Home Security Systems, Digital cameras, Electronic Cigarettes, E-CIG, MODS, Vape, Vaporizer, GPS, Digital calipers, calculators, electronic clocks, medical equipment, measuring instrument, sensors, radio transceiver, and many other electronics. This Exell Plastic Safe Cover Storage Carrying Case helps to keep your battery's terminals clean and free from unwanted debris and accidental scratches; which could possibly damage them. The Polypropylene box holds one 26650 battery. This lightweight, yet strong storage box will keep your spare batteries clean, safe and ready to use. 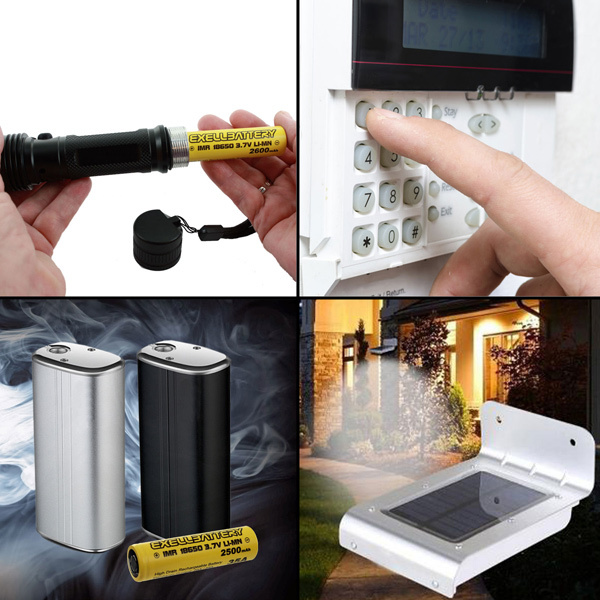 Made out of a highly durable plastic material, it is the perfect place to keep your batteries safe and protected from any accidental shorts or impact damage. Store and carry your 18650, 16340, CR123A Li-Ion/LiMN batteries safely in our Clear Plastic Carry Case. Need more Exell Battery 26650HP34_2QTY_26650-2xCS? We offer great discounts on quantity orders and FREE SHIPPING offers are available. No specification or documents available currently available for 26650HP34_2QTY_26650-2xCS. If you require a spec sheet, a msds sheet or any additional documents, please contact us and to request them. We will work to accommodate you.